I’ve been mulling on baby food. At seven months old, Ike has broken out of the rice cereal box. While I love introducing him to table food, I also think there has to be something between unseasoned purées and fully seasoned table food. Something besides Cheerios, that is. Raw (not steamed) vegetables and fruits seem like they should be a typical baby food. Not only do raw foods contain lovely macrobiotic properties, but they taste less bitter than cooked vegetables. The stumbling block is getting the food broken down for baby so they don’t have to “chew” on it. The other week I tried whipping carrots and broccoli through the food processor, but they didn’t get small enough for Ike. He hacked a couple times. Not good. In the meantime, I found mixing rice cereal with “reserved liquids” worked quite well. Ike pretty much gobbled up everything so far: the tomato-onion water from pico de gallo salsa, the simmering water from aromatic black beans, broth from vegetable soup. These are all a hit with Ike, but still do not reveal the deliciousness of good, clean vegetables. So this raw thing continued to plague me. I mean, I’m cooking and munching on prep scraps, thinking there has to be a way for Ike to enjoy this as well. I had some ideas tonight… I tried the garlic press… I tried the parmesan grater… Then I tried the microplane zester and SUCCESS! 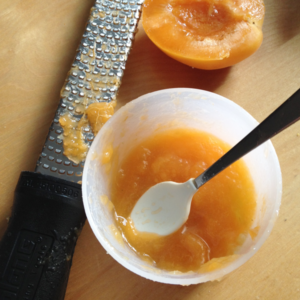 I turned relatively firm fruit into a beautiful purée for Ike. He loved it. Then he got full and cranky and wanted to go to bed. But I kept on… I tried apples, carrots and grapes. And I think the zester is IT. With fruit, you can just halve the item and grate against the zester down to the skin. For vegetables, you have to be a little more careful with your fingers. Just grate until concern for the well-being of your knuckles outweighs the amount of food left in your fingertips. Is it weird to say that I am thrilled to introduce “the salad” to my son? I mean, I just love the idea that I can show my infant child the beauty of fresh fruit and vegetables. Call me a nerd. A garden nerd, that is.